Editor’s note: Welcome to the new Michoud Assembly Facility Blog! This blog will accompany our media web site to provide an inside look and perspective on NASA’s Michoud facility in New Orleans — the people, the work, the capability, the mission…cajun-style! Got any ideas for blogs? Let us know! E-mail us at angela.d.storey@nasa.gov. The last several months have been filled with a flurry of activity at the Michoud Assembly Facility. In January, the STS-126 crew visited Michoud to thank our work force for their important role in the crew’s successful launch and mission. 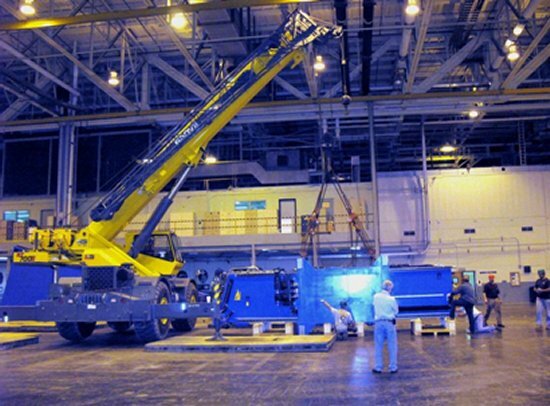 Transition truly began taking shape in February and March with facility modifications for Orion work and installation of the robotic weld tooling for the Orion project. ET-130 is already on the launch pad for the STS-125 launch in May. ET-131 is also at Kennedy Space Center ready to support the STS-127 June launch and the External Tank assembly team is close to completing ET-132 which will ship from Michoud to Kennedy Space Center in early May. The LaSpace/NASA Michoud Education Fellow Program hosted its first scientist telecon in March for 60 local high school students, focusing on orbital mechanics. 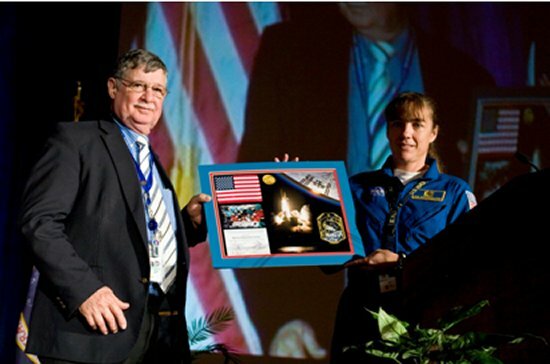 Michoud also participated in a Covington job fair reaching over 1,600 high school students in Louisiana, educating them on the many exciting career paths in science and technology. April brought key Friction Stir Welding stakeholders to Michoud for a meeting to discuss the value of the technology and how to move the technology into the U.S. industry, specifically the aluminum shipbuilding industry. On April 16, the Orion team completed a milestone with a successful first robotic weld on an Orion crew module ground test article. As you can see, Michoud continues to be a place of innovation and excellence, opening doors of opportunity for technology, economic development and education in Louisiana. 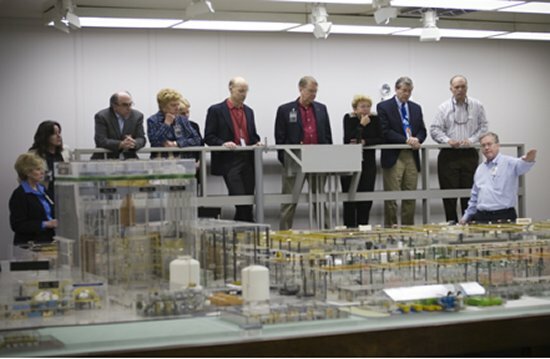 NASA’s Aerospace Safety Advisory Panel (ASAP) during a facility tour March 6. Moving to another area of excellence, I would like to commend the external tank team members for their meticulous attention to detail and commitment to safety. During the last three shuttle missions, the external tank has performed superbly with minimal loss of thermal protection system. Our work at Michoud is vital to providing safe, reliable shuttle missions. 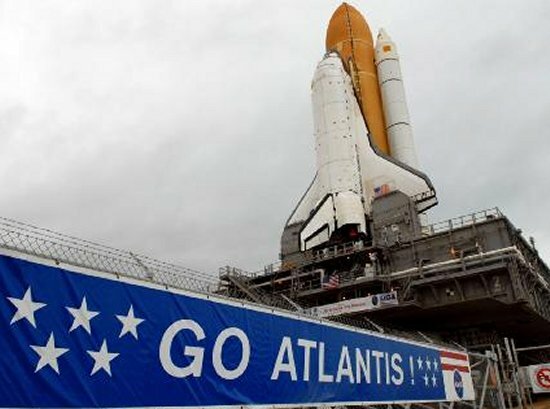 Because of your commitment to excellence, the shuttle missions are the safest they have ever been. Thank you! 2009 is going to be a year of significant change for Michoud and I want to share our five-year vision for Michoud. We are transitioning our facility to a multi-product and a multi-customer facility. We will ensure delivery of external tank hardware, while providing start up and manufacturing support for various activities within Ares and Orion projects. This includes implementing an integrated master plan and investments, upgrades, new facilities and retrofitting existing facilities. We will partner with the state of Louisiana for continued growth at Michoud, and bolster Greater New Orleans recovery efforts by supporting regional rebuilding and improving the quality of life for Michoud employees. That’s a tall order — but we are poised to move forward successfully with these endeavors. Finally, I would like to update you on the status of the Manufacturing Support for Facility Operations (MSFOC) contract. The contract is slated to be awarded in the very near future. We have developed a 62-day transition plan to turn over facilities management to the new contractor. This contract will enable Michoud to move from a single project facility to a multi-project facility managing the Shuttle External Tank, Orion, Ares I Upper Stage, Ares instrument unit and Ares V Earth Departure Stage and Booster projects. In addition, Michoud includes the National Center for Advanced Manufacturing (NCAM), federal tenants and future green space development and collaborative partnerships with the state of Louisiana. NASA will hold an employee general assembly meeting soon to announce the contract award and introduce the new contractor. We have a lot to look forward to in 2009 — and for decades to come, enabling the next generation of human spacecraft to the moon, Mars and beyond.